Last night I went to Winchester Discovery Centre for my first Loose Muse event. I’d heard about them from friends who write fiction, but this one centered on poetry. Run by Sue Wrinch, Loose Muse celebrates literary women. I apologise now for missing out a whole load of people’s names from this account. If I’d been more on the ball, I’d have realised I would want to blog and maybe made a list and, you know, done some research. Bloody poets. Can’t trust them to be professional reporters. Top of the bill was Rhian Edwards, who had been persuaded to bring her ukelele along as well as her fabulous poems. Full disclosure: I already knew I’d love her performance, not only because my Welsh half pulls that way, but also she was half the judging panel awarding me the Cardiff prize last summer. A decision of two halves, then, which happily is the correct one. She was brilliant. Anyone who can calmly clasp their hands behind their back and recite all their work BY HEART is special. When that person reaches to a nearby table and straps on a uke … well. She delighted us with poems from her collection Clueless Dogs: in turns funny, playful and melancholy. My only regret is forgetting to ask her to sign the copy I bought later. I heard a stream of clever, articulate, talented writers reading poems about love, the 11-plus, loss, talking plants, invoking religious ceremonies and more. It was incredibly varied and fantastic to listen to. Sue had even generously made room for frankly over-qualified and giddily successful novelist (my description, and I think you’ll find it’s a fair one) Claire Fuller, who read a tiny piece of fiction about a boy who ran away from home for less than a day. Two local writers closed the evening. 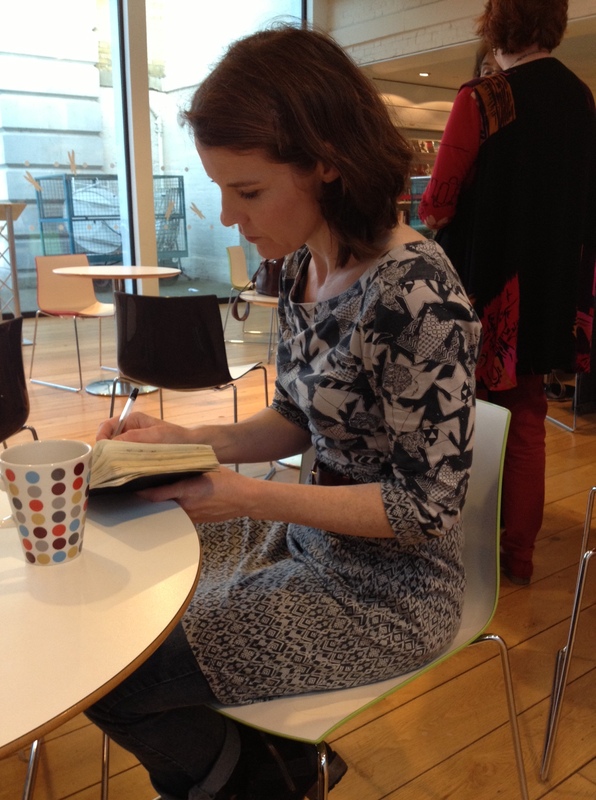 Helen Whitten won the Winchester Writers’ Festival poetry competition in 2013. [Another aside: in a bizarre coincidence I met Helen recently at a poetry performance workshop run by Live Canon at RADA. Poets from all over the place were there, yet we discovered we both live in the same road. Plus she wants to learn the cello, so I’ve offered to start her off. No, you didn’t need to know that but it’s interesting, dammit.] She read a number of her poems, which look acutely at the world and dare you not to examine your prejudices. Beautiful language, and one in particular relating a shocking incident that left us reeling. That is powerful writing at work. The final reader was a local short story writer I hadn’t previously known: Rebecca Lyon. She read a story that had me giggling all the way through, and performed it perfectly, inhabiting her characters so completely the way she changed her voice seemed the least of it. If I tell you it was about a defecating cat and succulents and crossing into the dangerous part of an estate, you won’t understand. It was hilarious and touching, and a great way to end the evening. PS: If you’re interested, this is the one I chose to read. It is very silly, and probably sounds better out loud. the Lloyds Building, no less. Little is endowed with less appeal. to those poor watchers idling below. transfixed while he rummaged deep. so I imagine it was not a wasted excavation. now obstructions no longer lingered unfingered. the one so recently employed for eating? It was a great evening, bogies and all. I think that should be my epitaph. It was my first Loose Muse too (tempted along by Rebecca and Claire) and I thoroughly enjoyed it. Some brilliant pieces, including yours Isabel (I used to work in the City too and also have some glass lift memories) and am looking forward to the next one. Wasn’t it a great atmosphere? Informal, not pin-drop silent. I liked it. That has been explored at length on Twitter. I think some popular ones are too rude even for here. Sounds like a fab night, with that unmistakable Loose Muse atmosphere I know from London events. I think you picked the right poem to read! Thanks – so do I! There is a place for deep and meaningful, but I wasn’t going to go for it there. very informative content at ths place.